Cutlery tray on the top which is easier to load and unload and more hygenic. COLLECTION ONLY. This is a really nice looking and efficient machine. Height adjustable tray and upper basket. 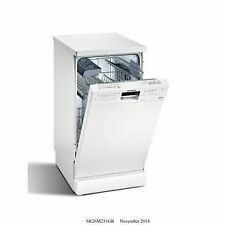 Siemens iQ300 45cm Slim, Freestanding White Dishwasher. Used. Condition is Used. Used, still functioning when removed last week, showing signs of use but overall condition is fine with no major defects. Selling because whole kitchen is being replaced. Includes original instruction manuals. • emotionLight for full illumination of the entire dishwasher interior. varioFlex Plus basket. Extra functions Display function. Height in cm 85cm high. Depth in cm 60cm deep. Width in cm 60cm wide. Number of Different Temperatures 6 temperatures. Countertop No. Number of place settings 12 place setting. 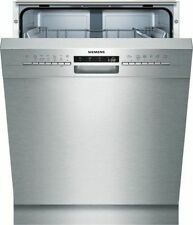 siemens dishwasher Stainless steel. Condition is Used. Collection in person only. 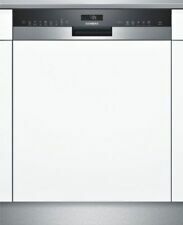 Bosch slimline dishwasher. and can take any unwanted washer way. MK1/MK2/MK3/MK4/MK5/MK6/MK7/MK8/MK9/MK10. NN7/NN8/NN9/NN10/NN29. It had the top taken off to fit under the unit and the top has been misplaced. Once fitted under your worktop this wont be able to be seen. 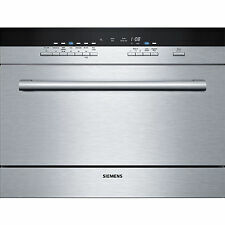 Siemens dishwasher used. Condition is Used.great clean condition. Would deliver locally at an agreed cost. Many years. I am in SW Scotland and it needs to be collected. Cute blue interior light. In very good working order and clean condition. New equivalent is almost £600. Cash on Collection preferred, Collection only, Petersfield, returns not accepted. This is a brand new product but bought for a kitchen never fitted. No silly offers please. This is complete and as new. Nothing is missing. It even has a guarantee that starts when you activate it. 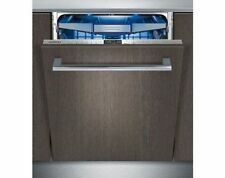 Type Built In Fully Integrated Dishwasher. There are number of reasons that a product may be graded:-. Why this Product is Graded. Foldable Plate Racks in Top Basket 2. Foldable Plate Racks in Bottom Basket 4. The detergent is then distributed evenly throughout the machine to achieve optimum cleaning results. For added versatility, the SN258W06TG is equipped with foldable, divisible levels and 6 foldable racks in the upper basket, plus glass stem holders in the lower basket. This dishwasher holds up to 14 place settings, making it ideal for busy households. With a flexible basket, this model allows you to customise the interior to suit your needs. Place Settings: 14. Half Load / Zone Wash Option Yes. Why this Product is Graded. Condition: Unused Graded. There are number of reasons that a product may be graded:-. We are based inLeicester 10 minutes drive from Junction 21 of the M1 motorway. Type Dishwasher. Depth (mm) 600. Width (mm) 600. Height (mm) 845. Annual Energy Consumption (kWh) 237. Annual Water Consumption (Litres) 5660. Noise Level (dB ) 42. Pre-Rinse Yes. Model extraKlasse SN236W02IG. Type Dishwasher. Child Lock Yes. Colour White. Machine Care Yes. There are number of reasons that a product may be graded:-. Condition: Unused Graded. Why this Product is Graded. Produktgruppe: Geschirrspüler. Trocknungseffizienzklasse: A auf einer Skala von G (geringste Effizienz) bis A (höchste Effizienz). - Bis zu 66% schneller zu glänzenden Spül- und Trocknungsergebnissen dank varioSpeed Plus. Type Dishwasher. There are number of reasons that a product may be graded:-. Condition: Unused Graded. Why this Product is Graded. We are based inLeicester 10 minutes drive from Junction 21 of the M1 motorway. Fit Type Fully Integrated. Width 60cm. Maximum Wash Temperature (°Celsius) 70. Minimum Wash Temperature (°Celsius) 40. Colour Stainless steel. There are number of reasons that a product may be graded:-. Dishwasher HA2989. 13 Place Fully Integrated. Maximum Wash Temperature (Celsius) 70. Minimum Wash Temperature (Celsius) 40. Noise Level (Decibels) 44dB. 12 Months Warranty. Water Consumption (Litres - Per Annum) 1820L. (Q)What condition are your products in?. Best Wishes From. Dishwasher Type Slimline Dishwasher. 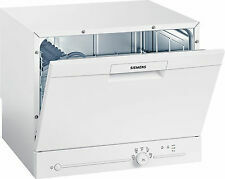 Category Slimline Dishwashers. Colour Silver. Number of Place Settings 10 Place Setting. This is subject to the size of the product ( getting past obstructions / through doorways ) and also in weight. Actual energy consumption will depend on how the appliance is used. Energy Efficiency Class: A (on an Energy Efficiency Class scale from A to D). Easy glide rails for all three basket levels. LED salt refill indicator, LED rinse aid refill indicator. DoorOpen Assist for handleless kitchens. Noise level dB (A) re 1pW: 41 dB. Accepts varioDrawer accessory (rails already installed in top level). Installation typeFully integrated. LED salt refill indicator, LED rinse aid refill indicator. International order designation: SN636X01KE. -Service material no. : SN636X01KE. 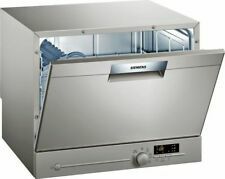 Programs and special functions 6 programs: Intensive 70 ° C, auto 45-65 ° C, eco 50 ° C, glass 40 ° C, 1 h 65 ° C, prewash. You will have the option to extend it to 24 months or 36 months. If your product is covered by either 12 or 24 months manufactures warranty OUR extended warranty will NOT start until the manufactures warranty has ended. Number of Place Settings 14 Place Setting. They use a pallet truck, so as long as access is via a smooth level driveway, there will be no problems. If, however, you live at the end of a steep or gravelled drive, then the driver will not be able to negotiate it with his pallet truck. MPN SN636X01CE. Modell SN636X01CE. -International order designation: SN636X01CE. -Service material no. : SN636X01CE. Programs and special functions 6 programs: Intensive 70 ° C, auto 45-65 ° C, eco silence 50 ° C 50 ° C, glass 40 ° C, 1 h 65 ° C.
Noise level dB (A) re 1pW: 48 dB. Capacity: 13 place settings. Energy Efficiency Class: A . Programs and special functions 6 programs: Intensive 70 ° C, auto 45-65 ° C, eco 50 ° C, glass 40 ° C, TurboSpeed 20 min 65 ° C, 1 h. -Product group: dishwasher. -Gross weight: 39.0 kg. Capacity: 13 place settings. Dishwasher Size. Delicate Wash. Rinse Aid Indicator. They use a pallet truck, so as long as access is via a smooth level driveway, there will be no problems. If, however, you live at the end of a steep or gravelled drive, then the driver will not be able to negotiate it with his pallet truck.